Still Plays Video Games: EA is Rocking with The Old Republic! I really, truly hoped, for some gameplay footage of Star Wars: The Old Republic at E3. We didn't get that, but what we got was an absolutely amazing cinematic trailer that blew commenters away. Twitter #e3 was, and probably still is, alive with buzz about the effect the trailer had on Star Wars fans and non-fans (do those actually exist?) alike. Star Wars: The Old Republic, being developed and published by BioWare and LucasArts, represents an innovative approach to interactive entertainment, featuring immersive storytelling, dynamic combat and intelligent companion characters. Intelligent companion characters has me sincerely interested, responsive and intelligent decision making, even when I make boneheaded mistakes would be nice to see in an MMO. 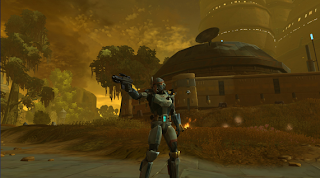 That's a good indication that EA and LucasArts can finally break the tether between the Star Wars Galaxies - Sony Online Entertainment nightmare and the Star Wars franchise. That much time between the two settings gives me hope that like the Matrix: Online, SWG is going to go offline and forgotten. Originally, SWG was an absolute dream, one could, if they chose, sit in the infamous cantina of Mos Eisley and listen to the band forever and true entertainment could be had just from players walking in and out. The variety of players, their singular reactions to the environment were really what being a fan is all about. Unfortunately, then came the re-vamps of the game, total wipes of entire classes of character, and the "New Gaming Experience" that SOE pushed so hard when all they had to do was stick to their original theme. I am still reeling, from @louiethecat (of G4) who, and I must paraphrase him, sorry, when he referred to SWG as a debacle of a game. He is so incredibly right, thank God gamers actually say what they think. I've always loved the Bounty Hunters of Star Wars, they are a class all to themselves and no Star Wars vehicle is complete without one, in my opinion. So, I am very excited to see the treatment of them in TOR. What we wanted for BH in SWG, "Dual Wield", and access to story elements and characters associated with the notorious Extended Universe - Bounty Hunters Guild. 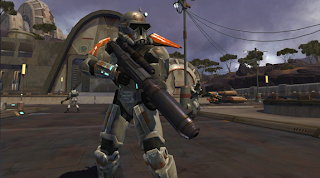 I personally played out the Bounty Hunter class, through good and bad, in SOE's SWG. Cries of nerf this and nerf that, eventually left the class crippled, when they were intially designed to be able to handle the "uber-class" Jedi in the game, to actually hunt them. So yes, if anyone was on Tarquinas and actually remembers when the first BH jetpack was made, well *toot toot*, that's my horn. Thank you George Lucas, for giving another chance on your universe being an enjoyable MMO experience. Best of luck to EA and BioWare, an insanely critical group of fans are watching and waiting with baited breath. If the actual game is anything like the E3 trailer, you've succeeded. LucasArts, the LucasArts logo, STAR WARS and related properties are trademarks in the United States and/or in other countries of Lucasfilm Ltd. and/or its affiliates. (C) 2008 Lucasfilm Entertainment Company Ltd. or Lucasfilm Ltd. All rights reserved.BioWare and the BioWare logo are trademarks or registered trademarks of EA International (Studio and Publishing) Ltd.